Barber County was organized on April 14, 1874, amidst "bond fraud" issues and padded census returns. The county was named for Thomas Barber, a freestater from Ohio who was killed on the road between Bloomington and Lawrence during the Wakarusa War in 1855 by proslavery men. James Lane called Barber one of the first Kansas martyrs of freedom and it was his suggestion the county be named for Barber. The name was misspelled as Barbour until an act of the 1883 legislature corrected it. It contains the cities of Hardtner, Hazelton, Isabel, Kiowa, Medicine Lodge, Sharon, and Sun City. The Medicine Lodge Peace Treaty was held in October 1867 with representatives from the Cheyenne, Arapahoe, Comanche, Kiowa, and Kiowa-Apache. It is estimated that there were between 5,000 and 15,000 participants. It is probable the first church was built in Medicine Lodge, but the first of record is that of the Methodist church in Lake City, founded 1881. The first school district was Rutlinger, formed in 1874, followed by Doles and Rock schools in 1879. The first county fair was held in Sun City in 1878. The county fair is currently in Hardtner. 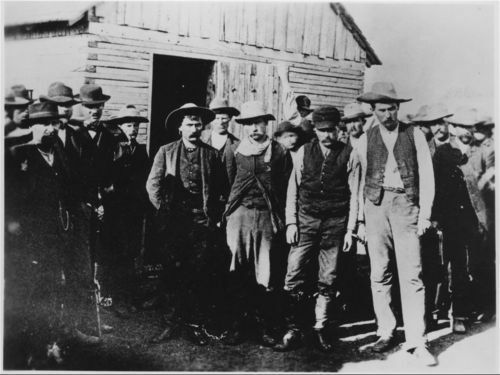 Carry Nation, famed "saloon buster" from Medicine Lodge. Jeremiah "Sockless Jerry" Simpson, Populist legislator and spokesman (1891-1899) lived in the county after 1878. Interesting sites in Barber County include the Grand Hotel, the Carry Nation Home, the Kiowa Historical Museum and Medicine Lodge Stockade. A rather lengthy "legend" entitled the Legend of Flower Pot Mountain, is related in Nellie Snyder Yost's Medicine Lodge. The story concerns Scott Cummins, the "Pilgrim Bard of Mule Creek," who told a fanciful eyewitness tale of frontier adventure about an immigrant train and other happenings. For more information see the Barber County website. Copies of Old Kiowa in History and Romance, by T. J. Dyer (out of print), Medicine Lodge, by Nellie Snyder Yost (out of print), A History of Kiowa, Old and New, On the Cowboy-Indian Frontier, by Jean M. Brown, and the Chosen Land, A History of Barber County, Kansas, (out of print) are all out of print books but available in the county libraries. The Barber County Historical Society has several sources available for research.